Bestselling romance author Adda Sinclaire has writer's block. Just when she catches her breath-and quite possibly the eye of a certain fabulously good-looking man--her arch-nemesis gives the pot one final stir. - Publisher Life for Adda Sinclaire, New York Times best-selling author, Historical Romance Writer Extraordinaire, ironically reads more like a country song than a bodice-bursting, breathless affair. For starters, she has no actual romance in her life. That might have something to do with the fact that her husband-correction-EX husband-ran off with Stick Woman, whom everyone knew would never be more that a mid-list author anyway. To add insult to injury (and another verse to the country song), he not only took their dog but gave it to her. If this isn't enough, Adda's come down with a horrible case of writer's block and finds herself the unwitting target of a romance cover model's misdirected (and completely unreciprocated) amorous advances. Just when she catches her breath-and quite possibly the eye of a certain fabulously good-looking man-her arch-nemesis gives the pot one final stir. Life for Adda Sinclaire, New York Times best-selling author, Historical Romance Writer Extraordinaire, ironically reads more like a country song than a bodice-bursting, breathless affair. For starters, she has no actual romance in her life. That might have something to do with the fact that her husband-correction-EX husband-ran off with Stick Woman, whom everyone knew would never be more that a mid-list author anyway. To add insult to injury (and another verse to the country song), he not only took their dog but gave it to her. If this isn't enough, Adda's come down with a horrible case of writer's block and finds herself the unwitting target of a romance cover model's misdirected (and completely unreciprocated) amorous advances. Just when she catches her breath-and quite possibly the eye of a certain fabulously good-looking man-her arch-nemesis gives the pot one final stir. 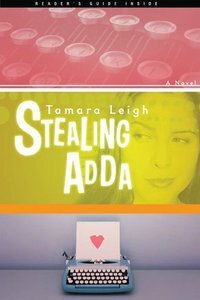 Tamara Leigh began writing romance novels to "get the stories out of her head." Over the course of one providential year, she gave birth to her first child, committed her life to Christ, gave up a career in speech pathology, and released her first novel. Her first seven novels earned awards and became national bestsellers, but Tamara was dissatisfied that the stories were not God-honoring. In 2003 she determined to write books that more directly represented her faith. Tamara and her husband, David, live with their two young sons in Tennessee.